Not having to worry about the cost of activities and dining on vacation is a great plus. There are different types of all inclusive rates. Some resorts include all meals and most activities. This is a great scenario if you plan to spend most of your time in one place, but many not be the best value if you are planning to explore a lot since you would be paying for meals that you would then not be able to make. If you, for example, know that you will be having breakfast and dinner at your hotel, and lunch elsewhere during the day, look for meal plans that allow such a flexibility. Hotels often offer packages as an option, so you have to book the package instead of just the room to get the special rate. More secluded the destination, the more likely the hotel is to offer a package that includes meals because they know that other restaurants are harder to get to. 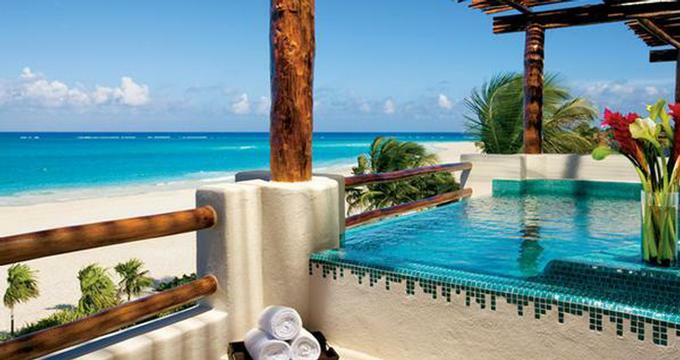 Our list includes many affordable all-inclusive vacations as well as ultra-luxury getaways. Couples Swept Away in Jamaica offers rates from just $290 and a diverse range of activities such as snorkeling, sailing and wind surfing. Guests can dine at six distinct restaurants offering a variety of flavors and settings that range from casual to sophisticated. The resort has three pools, a swim up bar and several Jacuzzis for those who prefer the pool. The sandy shore has soft sand and relaxing hammocks. Other top options in Jamaica are: Sandals Negril, Couples Tower Isle and Sandals Whitehouse. 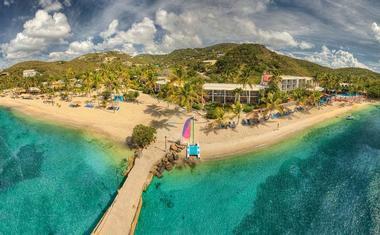 Check into the Peter Island Resort in the BVI. This tropical hideaway is a favorite with honeymooners and couples who like privacy and luxury service. The resort gives you a chance to try many different activities, including snorkeling, diving romantic beach picnics and ultra-relaxing massages at the spa. If you are looking for the ultimate private island honeymoon hideaway in the British Virgin Islands, check into this amazing resort. All-inclusive rates start at $530 USD per night. A unique eco-friendly hideaway on the edge of the ocean and the coral reef in Western Australia, Sal Salis offers guests the opportunity to get closer to nature. 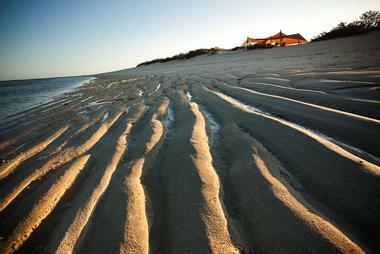 In the morning, wake up to the song of birds, ocean views and a glimpse of kangaroos grazing among the dunes. The hideaway offers 9 spacious wilderness tents just steps from the ocean and the beautiful coral reef. The tents were designed to blend with the surrounding dunes. They are set on raised platforms and breathtaking views of the sea and the land. Each tent has a comfortable bed and an environmentally friendly en suite bathroom. The main lodge has a lounge area with panoramic views across the reef and Indian Ocean. There is a library, board games and a dining area with a self-service bar. 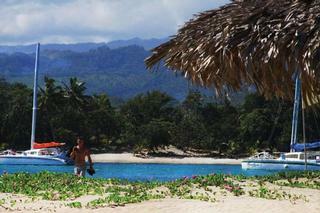 Swim in the surrounding ocean, relax on the beach, go snorkeling, kayaking and join one of the guided walks. Whale sharks are gentle and graceful animals - they are quite awe-inspiring from up close. We are used to seeing HD footage of these magnificent animals under water, but how many of us would jump in for a swim with them given a chance? What is sure to be a highlight of your trip to Australia, Sal Salis, Ningaloo Reef offers the opportunity to get in the water with these amazing animals. From April through July, the resort offers 3- and 4-night all-inclusive Whale Shark packages which start from AU$2,660 per person. The rate includes tented en-suite accommodation, all meals, beverages, daily guided activities and one swim cruise per person. The full day trip includes use of wetsuit and snorkel gear, gourmet buffet lunch onboard with soft drinks and a complementary DVD of your day. The night sky over the resort is simply spectacular. Bring your camera and take photos of star trails or just lie on the beach and enjoy the view. All-inclusive tent rates start at AU$375 per person per night, including meals and activities. Dolphin Island is a private ultra luxury island vacation getaway in Fiji that accommodates only a handful of couples at a time. You will have the island almost completely to yourself, which means empty beaches, unspoiled nature and romantic sunsets, a perfect honeymoon destination. The resort prepares all the meals, drinks and helps arrange daily activities. On the island, guests find snorkeling equipment for exploring the coral reefs with colorful Fijian fish and other marine life. Kayaks and a Hobie Catamaran are also included in the daily rate. A walking trail leads from the main buildings to the other side of the island. Plan a romantic picnic and lounge on the sandy beach. The resort is a 10-minute ride boat from the mainland. Fly to Nadi international airport. From the airport, the transfer by car (2 hours) and boat (10 minutes) is included in the cost of your stay. Alternatively, helicopter or a seaplane are available for additional cost. All inclusive beach vacation packages start at AUD $27,200 for two for 4 nights (64-7-378-5791). Great for honeymooners, Curtain Bluff in Antigua, West Indies, offers guests attentive service, a long sandy bay, variety of water sports and other activities. If you are a certified scuba diver, you can join one of the dives to Cades Reef without paying additional fees. Similarly, fishing enthusiasts can use the hotel boat on a complimentary basis. If you like to try many different activities, all-inclusive pricing can give you significant savings. The 5,000 square foot spa has luxurious treatment rooms, complete with balconies. After your massage, lounge next to the infinity-edge hot water plunge pool with views of the Caribbean Sea. All inclusive rates start at $645 per night. The resort is a great value for a families since children under two years of age stay in their parents' room free of charge. Children over two and under five years also stay free during the summer, and pay $75 otherwise. The list of inclusions is impressive, from all meals and drinks, including room service and mini-bar items; all watersports; all land-based activities; and fitness classes. VacationIdea.com Tip: Remember to look for deals and packages and more great getaways (888-289-9898, 268-462-8400). Whether you are planning a family getaway or an active couples' trip, the Gran Ventana in the Dominican Republic offers plenty of things to do, included in the cost of your stay. The Playa Dorada Tourist Complex offers quite a selection of activities and is the largest tourist development on the island. The Gran Ventana is ideal for those who want to combine relaxing with many activities. If you are looking for a beach resort with daily entertainment and many different activities, head to the all-inclusive Bolongo Bay Beach Resort on the scenic Caribbean island of St Thomas in the US Virgin Islands. The motto of the resort is day and night fun, from live entertainment 365 days a year to an impressive selection of beach toys and gear. When you check into the resort, the Activity Coordinators can help you line up all the activities that you want to learn, including stand-up paddle boarding, sailing and scuba diving. Take the free Discover Scuba Diving lesson taught by the experts at the St. Thomas Diving Club and start exploring the spectacular underwater Caribbean sea life. Other island adventures to try include deep sea fishing, parasailing, horseback riding, and kayaking with spotted eagle rays in the USVI wildlife sanctuaries. All-inclusive rates start at $409. You can choose from a European Plan (room-only rate) or the all-inclusive option. VacationIdea.com Tip: Book one of the Beachfront rooms if you want to be just steps from the sandy Caribbean beach (800-524-4746). Barbados is known for its colorful sunsets over the Caribbean Sea, beautiful sandy shore and pristine waters great for snorkeling and diving. The 88-room Crystal Cove offers rates that include meals and activities, including the Kids' Club with supervised activities, crafts and games, offering a good value to families. 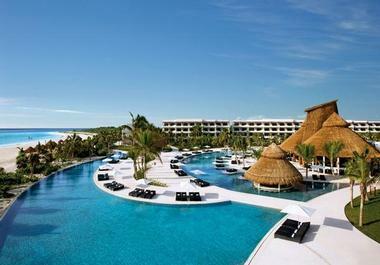 The resort has three lagoon-like pools, tennis courts, and two restaurants and bars. Turtle Beach Resort on the south coast of Barbados is another great option, especially for those who want more space since the resort has 161 suites with private patios. If you are looking for a luxury getaway where you will be pampered from head to toe with five star service, there are many excellent options. Heron Island in Australia has a new spa and luxury suites just steps from the water. You get to snorkel and scuba dive on the best coral reef in the world. Secrets Maroma Beach Riviera Cancun, Mexico has a very well thought-out all-inclusive program, the idea being that you should not worry about charges while relaxing on vacation. Once you book your stay and are quote a daily rate, you won't have to worry about tipping, taxes or activities because everything is included. The resort has a beautiful white-sand beach, several pools, a swim-up bar and plush guest accommodations with romantic touches. Enjoy 24-hour room service (also included), a 24-hour concierge to help you plan last minute romantic activities, and a complimentary mini-bar refreshed daily. The property is an all-suite getaway with 412 suites on 500 beautiful oceanfront acres. The suites are close to 12 smaller pools and a large infinity pool with spectacular ocean views. Dine at 7 gourmet restaurants and 8 bars, choosing from a variety of different flavors from around the world. For some extra pampering, head to the Secrets Spa by Pevonia which has outdoor and indoor treatment spaces, Jacuzzis, state-of-the-art fitness center, open-air theater and premium cocktails. There is an array of activities to choose from, ranging from stargazing rock n' roll parties and music lounge to land activities during the day. Take complimentary tennis clinics, plan volleyball, try archery, yoga, bocce, dance lessons, sailing, windsurfing, snorkeling and many more. Rates are all-inclusive. The resort can even include airfare in your reservation if you like (52 984-877-3600). At Kamalame Cay, vacationers enjoy "Guest of House Rates", so be sure to ask about this program when booking. This will cover all all food, beverage, spirits and house wines. However, there is an additional tax and gratuity charge. You will also have to pay for transfers yourself. Kamalame Cay is private and secluded, with spectacular views. There are just 11 guest rooms and cottages, so you can look forward to a quiet vacation. Tiamo Resorts is another good option. Located on the tropical island of Kunfunadhoo in Baa Atoll in the Maldives, Soneva Fushi is one of the best private island resorts in the world. This tropical paradise offers secluded beaches, gourmet gardens and spectacular views. There are just 65 guest villas, each with a private stretch of white sandy beach and a garden which extends from the bathroom. Many villas offer private swimming pools, ideal on a romantic honeymoon. The unique Six Senses Spa is famous for its relaxing and therapeutic treatments. Choose from signature journeys, Thai treatments, Balinese massage, doctor-assisted Ayurvedic and nutritional programs. Many dining options are offered, including a romantic evening under the stars, beachfront dining and in villa service. Rates start from US $625 per night. Browse more great trips. You may also like Soneva Gili and 15 Most Awesome Beach Picnics, Ever. If you are looking for the ultimate romantic idea for an incredible wedding proposal, honeymoon or anniversary, check into your own private villa at Soneva Fushi. Each private villa has two- to six bedrooms, a free-form pool and spectacular ocean views. The villas, which sell for $4 million and up, are available for rent through the resort's managed rental program. The villas were built using sustainable methods to preserve the island ecosystem. You will be able to snorkel just off the shore and explore the pristine waters around the island. Each of the accommodations has an enormous swimming pool which flows through the individual buildings of the villa complex. You can rent one of these properties through resort reservations. Rates start at $3,600 per night (+960 660-0304).